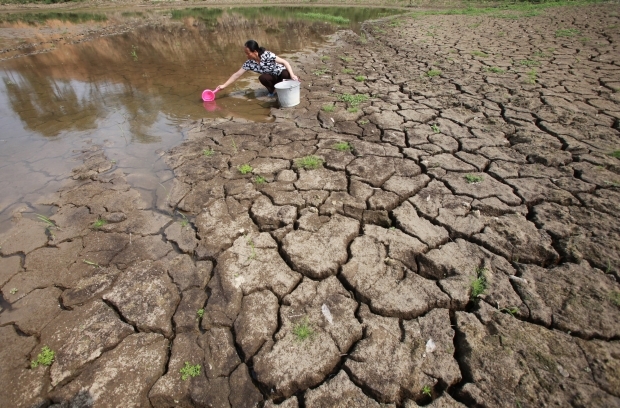 A villager ladles water from a parched paddy in from Tianlin County, Guangxi Zhuang Autonomous Region, south China, May 2012. High temperatures and low rainfall have combined to dry up most local rivers over the past three months, continuing a severe drought suffered in Tianlin over the past three years. By Debika Ray, a freelance journalist based in London. This article was first published by chinadialogue. Large-scale engineering projects and rigorous state control are hallmarks of the Chinese developmental model, and both have been apparent in the country’s approach to water management. A US$62 billion project to divert water from the south to the parched north is under way, while the government is investing US$3.35 billion in desalination plants, aiming to produce 2.2 million cubic meters of desalted water a day by 2015. In 2002, it attempted to implement a permit system for water access to curb over-abstraction. But such measures are proving insufficient to keep up with the country’s increasing demand for water. Rapid industrialization and urbanization are bleeding China dry and pumping pollutants into its rivers. The 2030 Water Resources Group predicts there will be a water shortfall of 199 billion cubic meters by 2030. The government is therefore turning to a new solution: the market, and allocating water through a system of tradable water rights. “It’s an attempt to move from a centralized, top-down system, to one with more horizontal arrangements between users,” says Dajun Shen, who led the Chinese side of the Water Entitlements and Trading (Wet) Project, an attempt by the Ministry of Water Resources and the Australian government to examine the feasibility of nationwide water-trading in China. Australia is one of a handful of countries that have implemented trading schemes to tackle water scarcity; Chile and the U.S. are others. Under such systems, water use is capped at a sustainable level, then users are allocated entitlements they can exchange like any property. Supporters of these schemes say applying market mechanisms to water ensures its price reflects its scarcity, that it encourages conservation, and that it allows water to be exchanged more easily between areas of abundance and shortage. But skeptics warn that such a system is impractical and could have devastating effects on those most at risk of water shortage. Nonetheless, China is embracing the concept. The Wet project, which ran from 2006 to 2008, was encouraged by the success of a few trial projects—in Inner Mongolia, Ningxia, and Zhejiang provinces, among others. The resulting proposal was a multi-faceted trading system with regional, individual, and sectoral elements. In 2008, the government outlined new principles for water allocation—the first, essential, step towards water-rights trading. However, progress since has been slow, mainly because of the logistical problems of defining rights for a free-flowing resource in a large country. In other words, a water market cannot compensate for poor governance. Past form, however, suggests that the Chinese government is capable of administering such schemes. “The water ministry is powerful,” says Jennifer Turner, director of the China Environment Forum at Washington’s Wilson Center think tank, pointing to its strict management of the Yellow River Basin, where water-rights allocation has progressed fastest. Indeed, the interventionist attitude of the Chinese state is, perhaps, what makes it uniquely placed to implement such a complex system. Water trading in other parts of the world has generally been based on a free-market model. China’s interest in trading reflects its increasing faith in individual property rights and laissez-faire economics, but the communist state is, as ever, forging its own path. While adopting the principles of exchange, the government plans to maintain strict control over transactions. In Wet pilot projects, for instance, prices were based on the amount of water saved in a given area and the costs of achieving this, rather than simply what buyers were willing to pay. Moreover, the ministry arranged the trades, investing the money in infrastructure rather than handing it over to the sellers. Such strict supervision could ensure water is allocated to its most beneficial uses and allow China’s system to avoid pitfalls such as the potential for speculation in water and price manipulation. The social effects of privatizing a common resource have been witnessed before—land reforms of the 1970s increased agricultural productivity, but were also associated with violence and antagonism. “Land grabs remain the biggest source of conflict in China today,” says Turner. Speed emphasizes that, like in other countries, the right to water for basic needs would remain. But it is possible that industries’ needs would trump those of others in the long run. “A strong sector like industry may damage weaker sectors like agriculture or ecological systems, and affect social stability,” says Shaofeng Jia, chair of the department of water and land resources at Beijing’s Institute of Geographic Sciences and Natural Resources Research. Ecological water requirements must be secured before rights are allocated for economic activities, he says.